Matte Ladle Turn Table, Designed and manufactured by Crib Point Engineering. 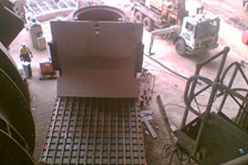 This Machine was purpose designed for the handling of Matte pots in a copper smelter. This machine has a design load of 70 tonnes and is built to run in extreme conditions and to withstand molten copper at 1175 degrees Celsius which is highly to corrosive to steel. 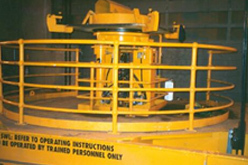 Crusher Maintenance Unit below. 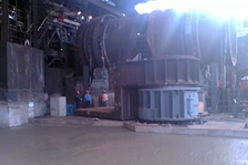 This machine Services the crushing head in a mine crusher in a Copper, Lead, Zinc and Gold mine in Queensland Australia. 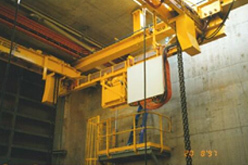 This machine uses gangs of chain hoists to support the crusher head and operator platform to allow for ease of removal or worn items.